Durham Public Schools is leading the state in developing and serving healthier and tastier nutritional choices for our students because we know that healthier students make better learners! We believe that no student should start his or her school day hungry -- so every child enrolled in Durham Public Schools can receive a healthy breakfast, absolutely free. No forms to fill out or documents to sign. Just go to the cafeteria or meal kiosk (available at select schools) and receive your food! This explains how we will use the information you give us. The Richard B. Russell National School Lunch Act requires the information on this application. You do not have to give the information, but if you do not, we cannot approve your child for free or reduced price meals. You must include the social security number of the adult household member who signs the application. The social security number is not required when you apply on behalf of a foster child or you list a Food Stamp Program, Temporary Assistance for Needy Families (TANF) Program or Food Distribution Program on Indian Reservations (FDPIR) identifier for your child or when you indicate that the adult household member signing the application does not have a social security number. We will use your information to determine if your child is eligible for free or reduced price meals, and for administration and enforcement of the lunch and breakfast programs. We MAY share your eligibility information with education, health, and nutrition programs to help them evaluate, fund, or determine benefits for their programs, auditors for program reviews, and law enforcement officials to help them look into violations of program rules. Individuals who are deaf, hard of hearing or have speech disabilities may contact USDA through the Federal Relay Service at 800.877.8339; or 800.845.6136 (Spanish). 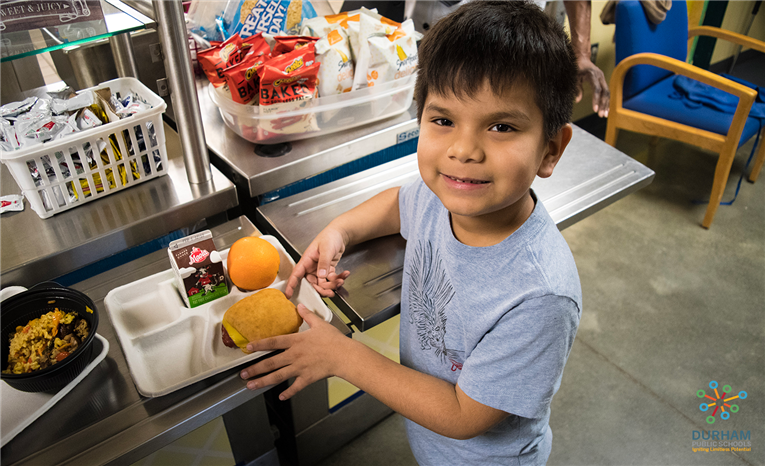 Meals served must be consistent with the current edition of the Dietary Guidelines for Americans, Federal Regulations as approved for North Carolina and State Board of Education Policy on Nutrition Standards for School Meals. When averaged over the week, reimbursable meals will contain 20-35% of calories from fat, and < 10% total calories from saturated fat. Trans fat and sodium levels will be monitored regularly and kept as low as possible. Reimbursable meals will contain no more than 200 mg cholesterol when averaged over breakfasts and lunches for the week. Food preparation methods for all foods will be limited to baking, roasting, broiling, boiling, and steaming. A minimum of 1 daily serving of whole grain products will be offered; whole grain foods will be increased gradually to a minimum of 8 servings per week as market availability of whole grain products increases to supply menu needs*. may be canned, frozen, fresh, or dried with preparation methods limited to baking, roasting, broiling, boiling, and steaming. Dark green, deep yellow or orange fruits or vegetables will be offered 3 or more times per week. Fresh fruits or vegetables will be offered at least 4 times weekly at breakfast and/or lunch. Legumes will be offered at least 1 time per week. All milk choices will be 1% or less fat. All After School Snack Programs (ASSP) administered by NC DPI shall meet the meal pattern requirements specified by the US Department of Agriculture. All foods and beverages available to students enrolled in the ASSP shall meet the same criteria required for A la Carte foods and beverages. D: Local School Nutrition Programs shall implement these nutrition standards in all elementary schools no later than the first day of the 2008 school year. E: The School Nutrition Services Section of the Department of Public Instruction shall review the nutrition standards for elementary schools annually and shall modify the standards as needed based on several criteria, including, but not limited to, current science, best practices in the food and beverage industry, and the availability and affordability of new foods and beverages. F: The School Nutrition Services Section of the Department of Public Instruction shall monitor the progress of each local school administrative unit toward achieving the nutrition standards and shall provide technical assistance and training as needed to assist local school administrative units in implementing the nutrition standards. Each local School Nutrition Program shall submit nutrient analysis of menus planned for the months of October and March annually; the analysis will be used to assess progress towards achieving the standards. G: The School Nutrition Services Section shall report annually on the progress of each local school administrative unit to the State Board of Education. H: Students who have special nutritional needs that are in conflict with the nutrition standards will be exempt from the standards. Each student’s special needs must be addressed through a medically-recognized document provided by a health care professional. When the child’s documented nutritional need differs from the nutrition standards, the School Nutrition Program will comply with a documented plan or other specific instructions. * A variety of whole grain products may not be readily available in all school districts; efforts to meet the daily target of whole grain foods will be contingent upon market availability.